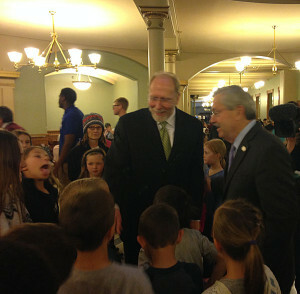 Rep. Dave Loebsack (left) & Gov. Terry Branstad talk with second graders at the statehouse Monday. Congressman Dave Loebsack of Iowa City says an active presidential campaign in Iowa will help the Iowa Democratic Party rebuild after 2014 election losses. Loebsack, a Democrat who has served in the U.S. House since 2007, is planning to seek reelection next year in the second congressional district, which spans 24 counties in the southeastern section of the state. He recently went to his hometown in Sioux City, however, to help recruit Democrats there and hold a fundraiser. He’s doing more traveling than normal, since he is the lone Democrat in Iowa’s congressional delegation. Two of the three Democrats who are running in the first congressional district raised almost seven times as much as Rod Blum of Dubuque, the first-term Republivan congressman from that district. Loebsack also predicts there’ll be a competitive Democratic Primary in Iowa’s third congressional district for the chance to run against Iowa’s other freshman congressman, Republican David Young of Van Meter. Loebsack, who was at the capitol in Des Moines Monday afternoon, met privately with the 69 Democrats who serve in the Iowa House and Senate.